I started off this month with an injured leg and hardly any internet in South Africa. 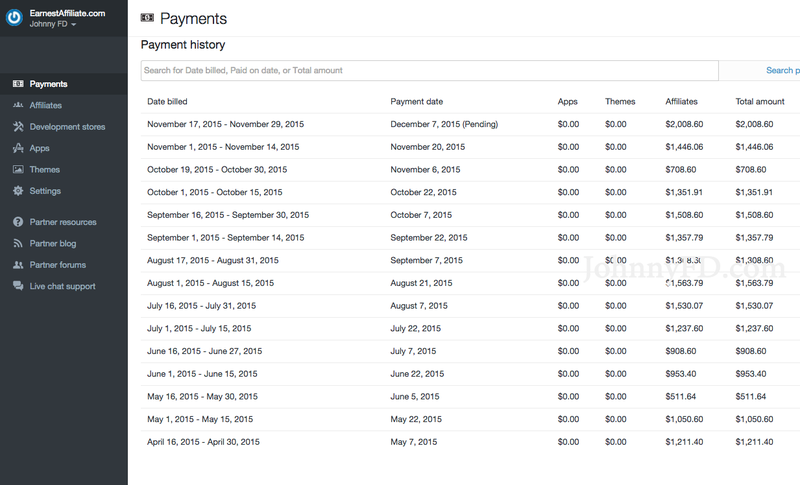 I had been tethering off of my iPhone and paying crazy data bills. But luckily, I somehow also got a lot done as I was in a cast and couldn't walk. 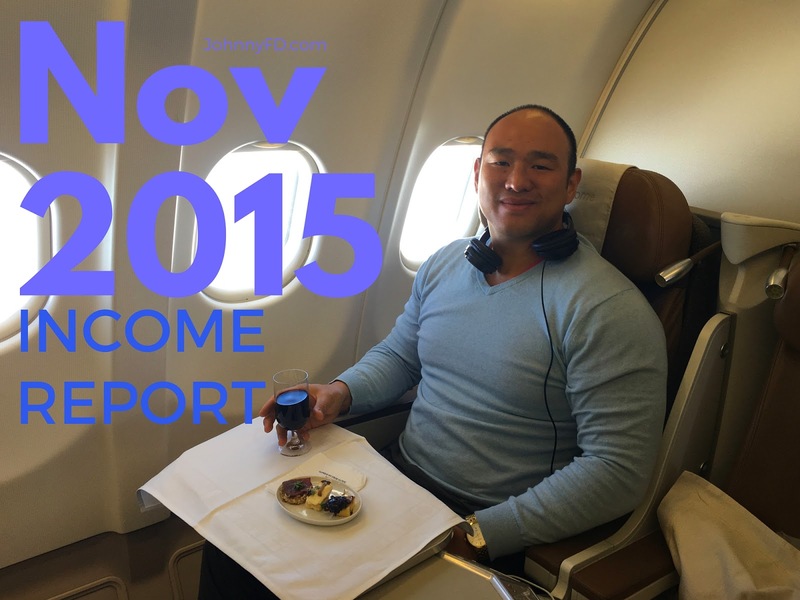 On November 2nd, I got on a plane and flew business class back to Chiang Mai where it's been a pretty crazy month. 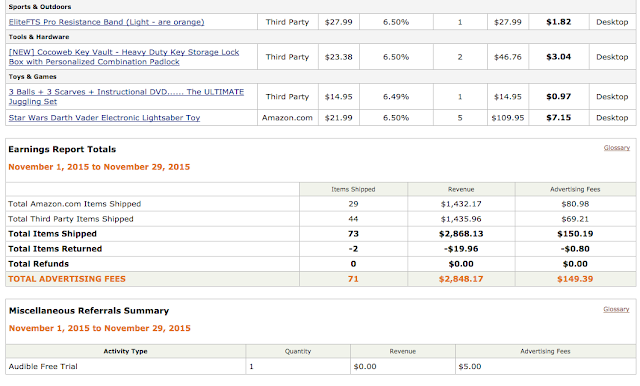 I'm writing this now hoping, but not being sure if I can really having a third $20k month again. It's insane to think just a year ago when I had my first $10,000 month I thought that was the ceiling or the limit. So even if my hot streak has a dip, I'm super fortunate to have saved a big chunk of my earnings as I tried not to increase my lifestyle or expenses by too much even though I was making a lot more money than I was used to. 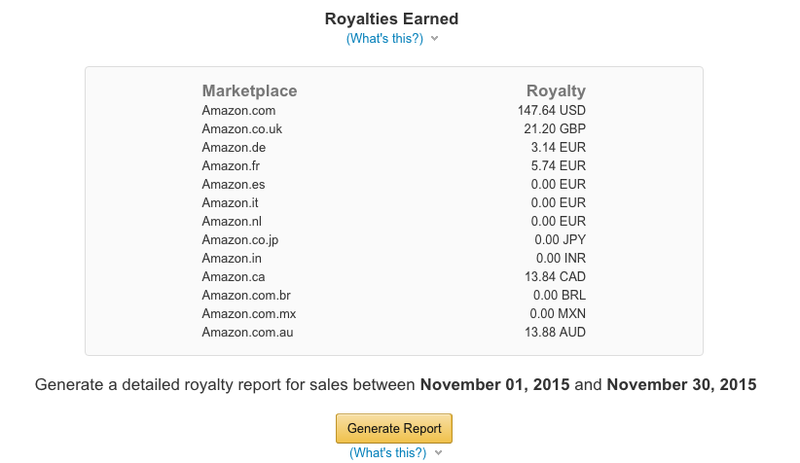 Here's my detailed income report for the month of November 2015 including screenshots of all of my online businesses. Follow along this video for a full explanation and backstory for each section where I explain what's been going on this month in detail. If you prefer to read first, you can save this video for the end by scrolling up when you're done. 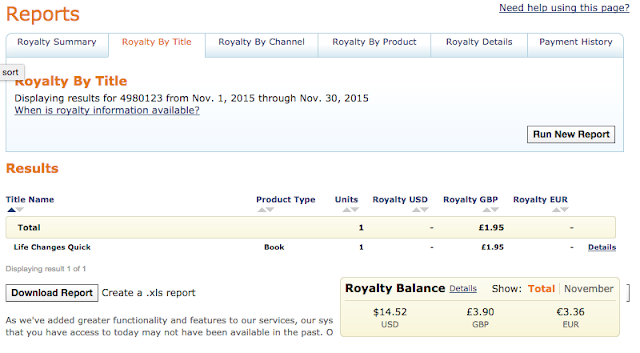 For some reason I can't view my eBook sales in PDF form this month but I manually added it up by looking at my paypal transactions and it looks like I had a really good month for 12 Weeks in Thailand: The Good Life on the Cheap for some reason. It could it's because it's getting to the holiday season and a lot of people are planning their trips to Thailand. 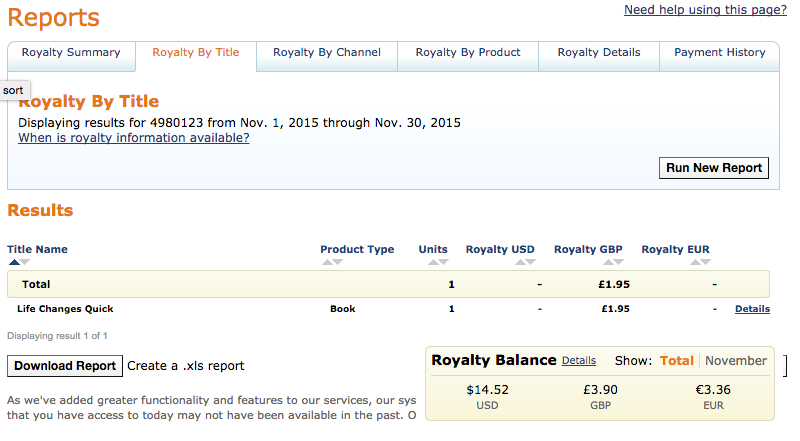 But either way, really glad to see more book sales coming in and for seeing more 5 star reviews on Amazon! Big thanks to Eric Murphy, George Baltakian, Khairul Izad and Mark Peters for taking the time to leave a review after reading the books. Really glad you guys enjoyed them! 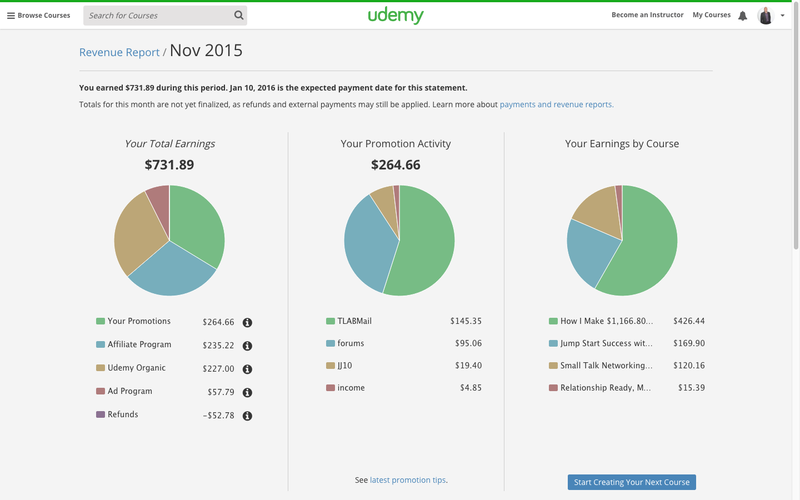 This next section is what I've been super excited about this month as I just launched my new Udemy course this month. I filmed the entire course while in South Africa and completed most of it while I had a cast on so it got done a lot quicker than I had expected...mainly because I had nothing else to do. My biggest goal for creating my new course on Udemy was to have it be an intro to my full membership course, Earnest Affiliate. If you're curious what the difference is between the two, I wrote a blog post about it here. But halfway through outlining the course, I knew that even though most people would buy it using some type of crazy discount and it'll never sell for full price, I wanted to really make it comprehensive regardless and really give a lot of value in it and it's been paying off. Big thanks to Logan H, Michael H, Nick B., Derek S., Lorrie H., and Louise C. for reviewing the course! 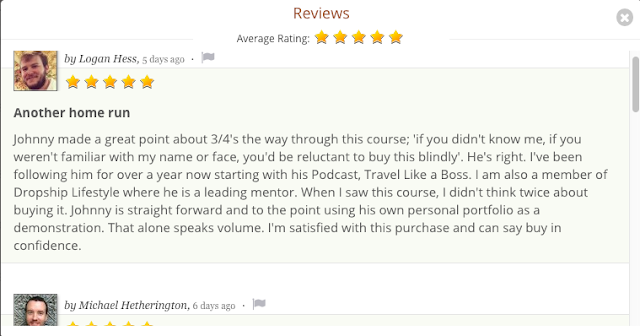 I think this has been a great start for my new Udemy Affiliate Course as it already has over 100 students and a bunch of good reviews so far which will hopefully carry in momentum throughout the year. By the time you read this, Anton's course is now closed and not taking new members until it reopens sometime in 2016. Since no one can actually buy his course this month, I wanted to take this opportunity to stress how important it is to jump on opportunities when they present themselves and be willing to put in the work. 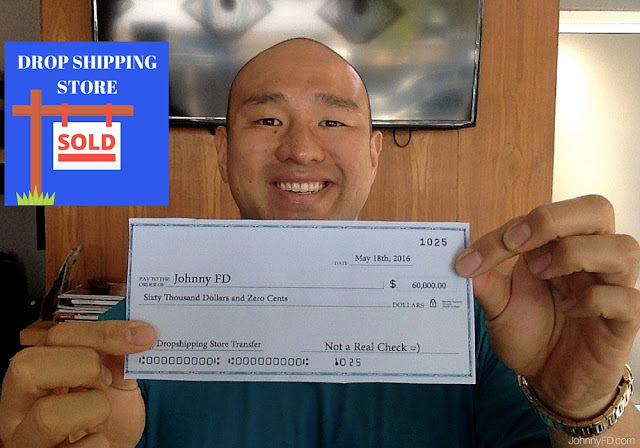 I joined Anton's course 2.5 years ago and it's been a full time source of income since. I honestly feel bad for anyone who has been debating back and forth and hasn't just pulled the trigger and bought the course while it was still open as what he teaches genuinely works. My advice? Keep in touch, save up some money, freelance, work on something else, and whenever he opens it back up in 2016 jump on it as it's one of the few programs out there that consistently delivers results. As for the store I run with Larissa we had a pretty good month in revenue but not the best we've had in profit. Part of the reason why my other store did so much better was because I run Black Friday and Cyber Monday promotions but forgot to tell Larissa to do the same until it was already too late. I don't know if it would have made that big of a difference because we didn't actually lower the price, just gave a coupon for free shipping like I always do but I think it people's minds they were looking for some type, any type of Black Friday sale. Lesson learned to implement it for next year. 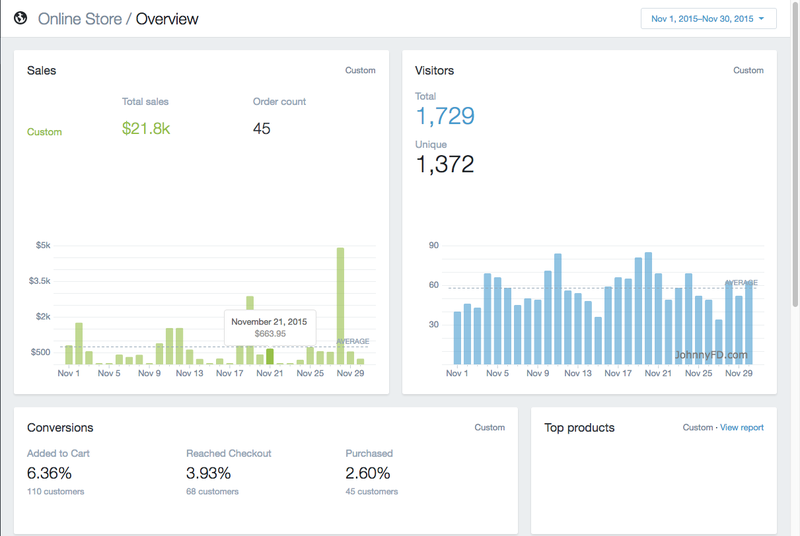 Either way, it's awesome to know that it's been exactly 1 year since Larissa and I started this new store together and it's been profitable every since. I've also been earning a ton of miles from using my rewards card to fulfill orders and have been using it to fly Business Class around the world for free. Since I'm spending on average $20,000 a month and getting 2.05% of that cash back, it's been adding up to at least $400 a month which is nice to count as a part of my total income. 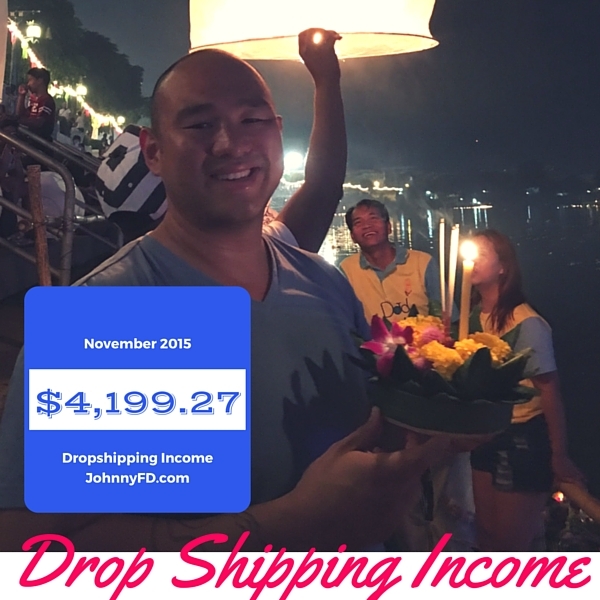 If you followed my blog from the beginning you'll know how excited I am to earn over $4k a month from drop shipping as that's what I used to make as my full time salary back in California working a 9-5 job. Now that I'm able to do it location independently, I'm super happy and want to share it with others. Unfortunately Anton's not taking new members for a while for his course but keep in touch and I'll let everyone know when it opens back up sometime in 2016. 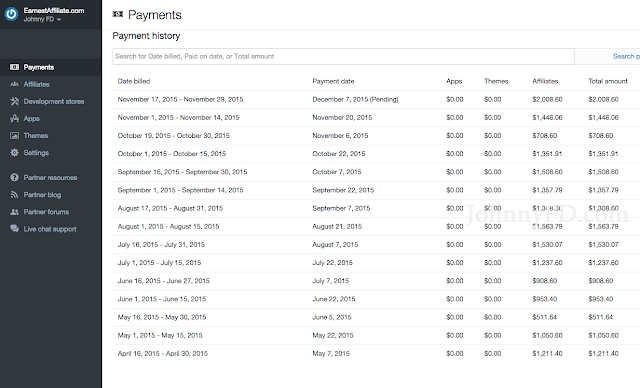 This month I made $6.15 from Adsense which I was actually going to just pause but realized it's not even worth my time to figure out how to turn it off. As for YouTube my estimated earnings were really good this month at $76.62 including 58 cents from their new Youtube Red program which I'm still not sure how it exactly works. 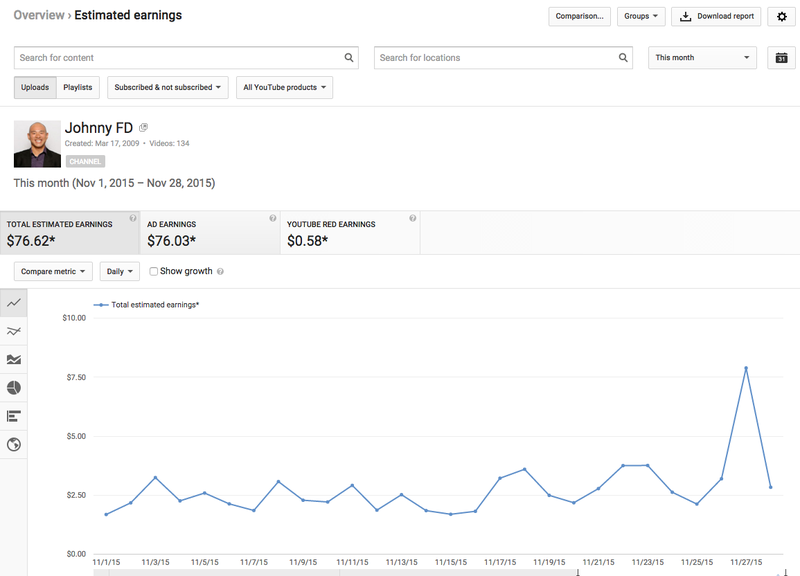 I'm assuming I get a small share of earnings from people who have signed up for the program and watch my channel or it could be from people who decide to sign up for Youtube Red after watching my channel? Either way I'm excited to see if that grows as YouTube's premium ad free service grows. 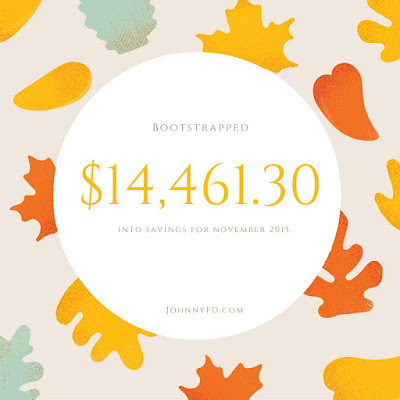 I also made $475 from Phone Coaching this month which I did a lot of in the first half of this month but am honestly a bit too busy for now so I raised the price so only really serious people sign up. 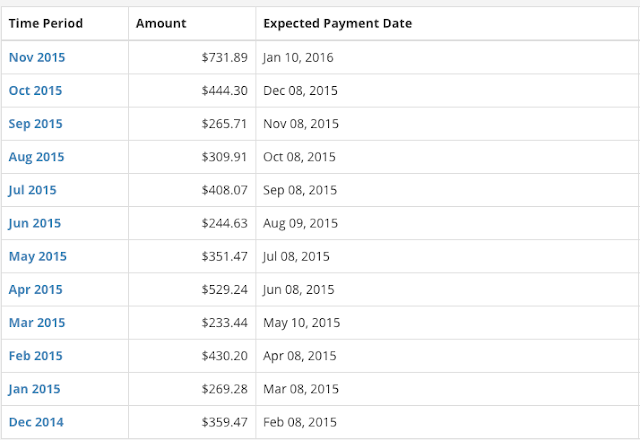 Even though I live write these income reports and have no idea what the final numbers are going to be until just now, I sometimes see "affiliate payment received" emails pop into my inbox so I have a vague idea of how the month is going to be. 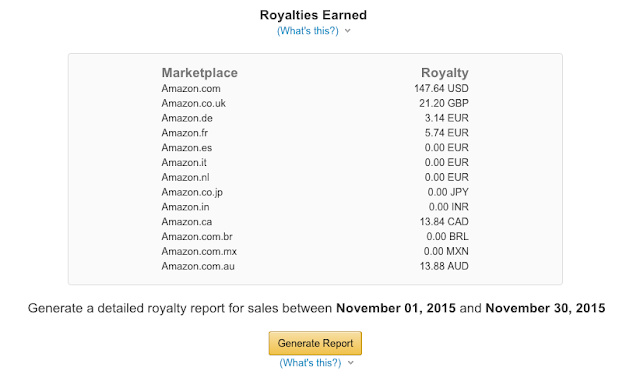 This month i'm really excited that there wasn't one big source and that my affiliate earnings are spread out over a bunch of different sources which is nice because it makes it a bit less volatile and a bit more stable. 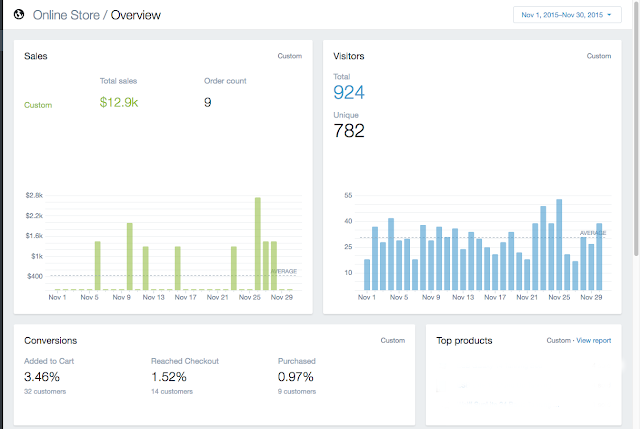 I reveal my exact sources of affiliate commission inside my course Earnest Affiliate but here are a few sneak peeks at some of my affiliate dashboards showing how much money I made from each network. 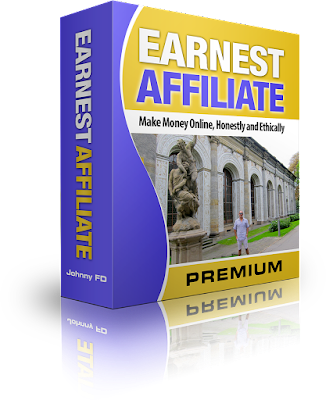 Join Earnest Affiliate to get full access to all of my affiliate case studies. As you all know I'm really excited to have more students in my course Earnest Affiliate which is why the price is currently so low and I'm paying affiliates 75% commission to promote my course just because I genuinely want as many committed (paying) students to join and do well as possible. This month I didn't make a ton of money from new student signups but I'm really glad to see that my existing students are starting to do well, including a few who have been making income already. But I'm most excited about the students who are thinking long term and building a brand and a following before they monetize their sites. Even though my income was at an all time high these past two months, and it was tempting to go ball out and increase my lifestyle, I kept a level head and kept my expenses relatively low for the month and didn't buy anything crazy to increase my fixed expenses either. I haven't been super good at keeping track of all of my expenses as I generally just try to not overspend while focusing on making more money but here's a rough idea of what I'm spending every month. Wheww. That's it. This has been a really humbling month as a lot has happened during it. But I'm so grateful and fortunate that I have so many positive support systems in place, loving and caring friends and family as well as all of you, my readers and supporters. I truly hope everyone reading this the world's success in these upcoming months and in the new year. I hope you all get to spend time with loved ones and family over December and make it home or plan to be with friends and loved ones this month. We are so blessed even with everything that is going on in the world and the obstacles that life throws at us. Keep in touch and let me know how it goes and what you're working on! P.S. If you haven't watched the video up top yet, scroll back up and watch it as I explain in much more detail what's been happening this past month. Let me know in the comments if you prefer the video embedded at the start or at the end of the income report. Very encouraging post! Johnny keeps crushing during holiday season! I like the video to be on the top better because I can understand easily with Johnny talking and navigating through the blog post. And people won't easily miss it. Hey Aidan really glad you enjoyed the post! Thanks for the insights on where to embed the video! As always love that you share this info to motivate me. You are truly a person that is honest and inspire others to be free of a 9-5 job. Good luck and heres to a great 2016. Hey Glen, really glad to be able to share. Best of luck to you as well in the new year! Thanks Andrew, I appreciate it buddy! Like the video near the beginning, although sometimes I prefer to read instead. Either way, it really helps keep me motivated and inspired to see your different income sources and how your changes help them grow. Hope to catch you at a meet-up while you're in the States! I think I'm leaning towards having the video in the beginning as well, that way people can know it's there then choose to read and come back to it later or watch it straight away. Glad to be able to share my different income sources and looking forward to meeting you when I get to the U.S.! I'm one of your Youtube subscribers. Heading to CM from the states later half of this month and was going to drop in at Punspace and say hi but you'll be heading to the states yourself. Going to see if I like CM and considering a move there. ...unless the internet breaks.... yeah then we're all screwed. Hey thanks Ian! I've really been trying to diversify and its working out! Thanks for the video suggestion on top! Have heard a bunch of your appearances on different podcasts, and finally stumbled upon your blog, all I can say is wow. I think there are a lot of us who are looking to reach your level, and the level of honesty and transparency that you put into your work/writing gives me a bit of hope that it's actually achievable. Keep up the good work! Hey Levi, super happy to share! Really glad you found me through the other podcasts! Let me know how everything goes on your end! Thanks Gareth, shame I missed you in South Africa! 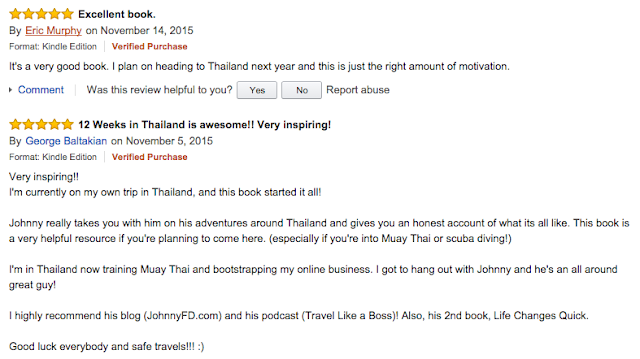 Let me know if you ever make it out to Thailand! Thanks Ali! Really glad you subscribed! Dude you had an amazing month again. 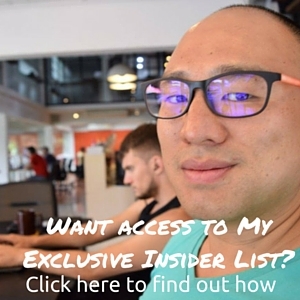 Do you think your income increased after you got featured on that Business Insider article? Or has it been really just growth through time? I also updated you on The Ultimate List of Blogger Incomes which of course you are in the top 5. Thanks for the kind words buddy, honestly I have no idea as it's a bit hard to track but I'm sure the exposure from Business Insider was a big part of it. But at the same time 90% of people who read those articles don't stick around or take any actual action, so in a sense it's much better to get 100 new readers that found you organically (they were searching for content you wrote) than to get 1,000 readers who just stumbled upon your blog. Cool man! Thanks for the info and keep up the great work. If I ever go to Thailand I would love to pick your brain and buy you a beer or something. Happy to. Let me know when you make it out! Thanks for providing the blueprint for every day ordinary people. Quick question,is this the final amount after you paid all your taxes ? Great job man! 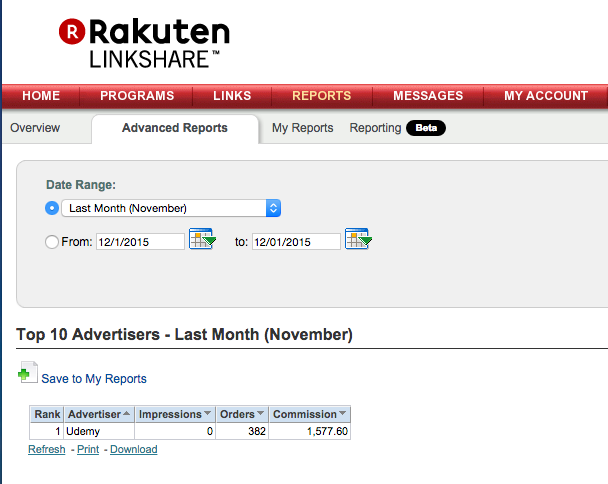 Keep posting these income reports. It's highly motivating. I own my own niche e-commerce site (however, I ship products myself). It's currently at $15-$20k per month gross. I'm looking into selling it for capital and create a less demanding e-commerce site. Thanks a lot for the inspiration! Kill it.. Can't wait till I can get to your level! Nice stuff Dexter! Glad you are doing well with traditional ecommerce! I can see why you'd rather not have the headache of buying and packing your own inventory! what do you rent for 12k THB? I have a small 1 bedroom Condo near Nimman. It normally goes for 18k a month but I signed a 1 year lease when they first opened. You can find older buildings or places further away from Nimman for around the same price as well. Johnny I love your lifestyle! My wife and me are really thinking to move to Thailand and start an online Passive Income business. In fact I've already started, the only thing is that is very small for now! Do you have any tip for us? This is very inspiring. 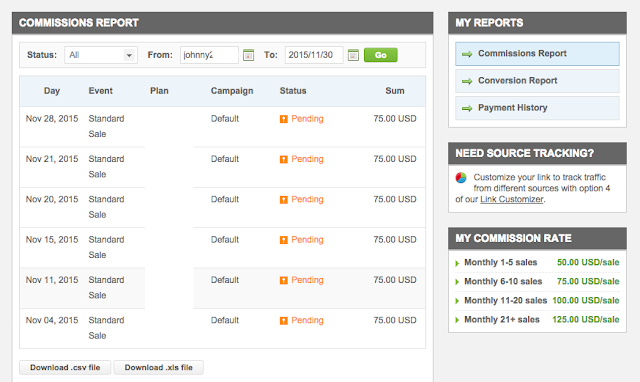 It gives me the best external motivation to work on my website and enjoy this sweet passive income fruit. Really happy to share! 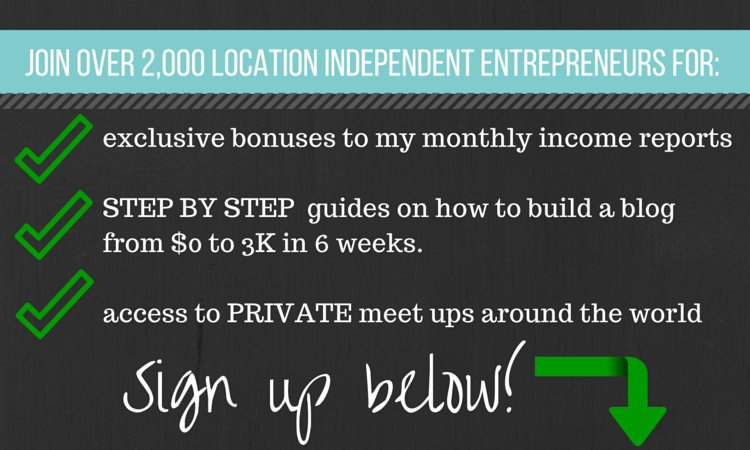 Make 2016 your year of passive income!